Ariat Relentless brown full quill Ostrich boots. Ariat Dual Pro with patented Traction Zones. In search of a pair of boots that are all arounders like you? Look no further. 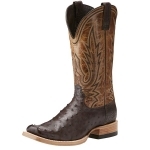 Ariat Exotics All Around boots are built to withstand use in numerous classes and then classy enough to be worn out on the town too. 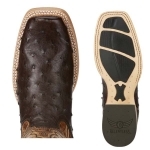 They don’t come much better than these with their full quill Ostrich, premium leather, and innovated technology. If you let these pass you by they will always be on your mind. Here’s for all you boys who are All Around winners. The foot is a deep rich brown with a beautiful tan upper. Brown goes with anything! Newly designed Ariat DualPro sole with patented traction zones and Ariat's top of the line ATS Pro insole technology.